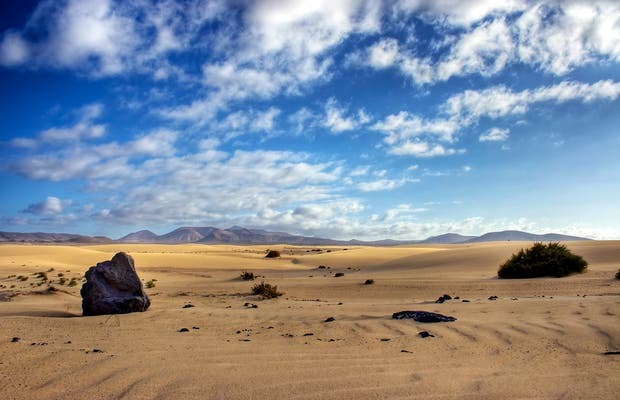 The natural park in Corralejo is located in the region of La Oliva, in the northern part of the island of Fuerteventura. It is an area with dunes, a bit like the ones in Maspalomas, south of Gran Canaria, but it is still a wild area. To get there, you first have to reach the town of Corralejo, accessible by public transportation, or from Lanzarote, there is a ferry that crosses a few times a day from the town of Playa Blanca. The natural park is 20 minutes away by car from the center of Corralejo. The dune area was declared a natural park in 2002, due to its great scientific interest, and its excellent state of preservation. You walk the dunes to reach the beach, and if you feel like exercising you can climb the other dunes, which are higher. You might slip in the dunes, it is quite funny. Surrounded by dunes in this immense protected park and with splendorous beaches, considered the best in the Canary Islands, we can submerge in different spiritual “baths”. I say spiritual because there is so much beauty around, that it is the feeling the landscape provokes. Fine and golden sand, a turquoise ocean and the stunning Isla de Lobos on the horizon make you feel privileged for being able to see and feel this. Besides being immense, there are a lot of surfers, with huts full of boards, the warm breeze is not uncomfortable and the coasts will make you fall in love with the place. In the north part of the island of Fuerteventura in the Canary Islands are the dunes of Corralejo, these dunes are located next to the beautiful turquoise waters of the village of Corralejo, a beautiful setting where you can enjoy the beautiful sunsets over the islands any time of the year.